Diane seems to have the perfect life. She is a wife, a mother, and the owner of Happy People Read and Drink Coffee, a cozy literary cafe in Paris. But when she suddenly loses her beloved husband and daughter in a tragic car accident, the world as she knows it instantly vanishes. Trapped and haunted by her memories, Diane retreats from friends and family, unable and unwilling to move forward. But one year later, Diane shocks her loved ones and makes the surprising decision to move to a small town on the Irish coast, finally determined to heal and rebuild her life alone—until she meets Edward, the attractive yet taciturn Irish photographer who lives next door. At first abrasive and unwelcoming, Edward initially resents Diane’s intrusion into his life of solitude . . . until he can no longer keep her at arm’s length, and they fall into a surprising and tumultuous romance. But will it last when Diane leaves Ireland, and Edward, for the home she once ran away from in Paris? At once heartbreaking and uplifting, Diane’s story is deeply felt, reminding us that love remembered is love enduring. I was drawn in by the title of this book, "Happy People Read and Drink Coffee" - what book lover wouldn't be. Unfortunately, the title proved way more inviting that the actual story. So consider yourself warned. 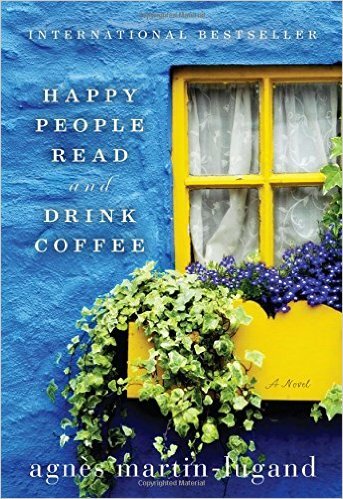 This is not a book about reading, it's not even really about coffee and it certainly is not about happy people. How ironic. It's a short read, more like a novella but everything about it was sadly caricatured and stereotypical. It was simplistic and adopted the overused storyline of: woman loses everything, moves to another country to find herself, meets handsome but moody neighbour and eventually they link up. The only thing that was not thankfully predictable was the ending. It is not what you would have expected. However I did not feel any connection with the one-dimensional characters and very quickly tired of their constant smoking, and then another smoke and then, let's just have another. It wasn't terrible but it just wasn't any good. It had such potential with such an inviting title, but it didn't deliver at all. I think the major flaw of the book is its shortness. With such a sweeping array of emotions, its difficult in such a short span to find them believable! The author portrayed desperate grief to new found resolutions in the intake of a breath. It is a tall order to ask the reader to take that on board in the space of less that 300 pages. The bickering between the lead characters was juvenile and mundane, bordering on rude. A sign to me of the amateurish writing. I found the main character just so unlikeable - she was drama filled, depressed and depressing. "Who'd want anything to do with you you? There's nothing interesting about you." The later actions are unbelievable because of the vehement dislike openly spoken and acted upon between the two leads. All up, a majorly disappointing read. "Before going inside, I glanced at the sign. Happy people ... " and it was anything but!